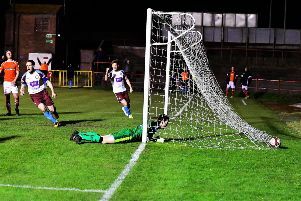 Martin Scott was at Mariners Park last night as Shields thrashed West Allotment Celtic. Image by Peter Talbot. Former Sunderland defender Martin Scott has been appointed as South Shields' assistant manager. Scott, who played for the Black Cats between 1994 and 1998, links up with joint managers Graham Fenton and Lee Picton at Mariners Park. The ex-Hartlepool United manager has also spent time on the coaching staff of Football League outfits Barnsley and Bury in the past. He links up with Shields after the departure of first-team coach Gary Middleton, who stepped down because of work commitments. Picton said: "Martin is a fantastic addition to the backroom staff. "He has so much experience in the game, having been first-team manager at Hartlepool and on the coaching staff at Barnsley. "He's also a UEFA Pro Licence coach, and hugely respected for his work in the game. "We're thoroughly looking forward to working with Martin going forward." Middleton was with Shields for 15 months, and was recently appointed as Head of Mens' Football at Gateshead College. On his departure, Picton added: "Gary has taken up a new role outside of South Shields at Gateshead College over recent weeks. "He just felt that he wasn’t able to fully commit to what he was doing at South Shields because of that. "We thoroughly appreciate all of his efforts over the past 15 months and wish him well in his new role, and whatever he chooses to do next. "I was aware this may happen a couple of weeks ago, because Gary said he had been thinking about it and told us so that we could put the wheels in motion if he was to step down." Shields are second in Northern League Division One, two points behind neighbours North Shields. They defeated West Allotment Celtic 5-1 last night.